The midsize sedan has impressed Port Orange drivers with a powerful and efficient engine with smooth handling and sharp design features. It’s a five-passenger ride packed with innovative technologies. The 2015 Ford Fusion is also a five-passenger midsize sedan with great fuel economy, a muscular engine, good looks, and state-of-the-art tech specs. These two models are competitors for all the right reasons. Lets take a look at a few of them and see which suits Palm Coast drivers best. The 2015 Chrysler 200 comes standard with a 2.4L four-cylinder engine rated at 184 hp and 173 lb-ft of torque. Optional on the S and C trims is a more powerful 3.6L V6 engine that produces 295 hp and 262 lb-ft of torque. A nine-speed automatic transmission is matched with both, while front-wheel drive is standard; all-wheel drive is optional with the V6 engine. The 2015 Ford Fusion offers three engine options: the first is a 1.6L four-cylinder paired with a six-speed automatic transmission producing a comparable 182 hp and 184 lb-ft of torque. A similar but turbocharged 1.5L engine option produces a similar power rating of 181 hp and 185 lb-ft. of torque. And then the third option is a 2.0L four-cylinder with 240 hp and 270 lb-ft of torque. The 2015 Chrysler 200 offers up to 36 mpg highway, whereas the 2015 Ford Fusion can achieve up to 34 mpg highway. While the Chrysler’s most powerful engine nominally overpowers the Ford’s, the Ford offers more engine options with a higher torque rating. For efficiency and power, these two midsize sedans both score high, and Palm Coast drivers should be pleased with either one. Both the 2015 200 and the 2015 Fusion come standard with anti-lock brakes, traction and stability control, and plenty of airbags, including front knee airbags. Both offer advanced safety technology features such as lane departure warning systems and frontal collision warning systems. While the 2015 200 features an innovative blind spot warning system on its SafetyTec package, the Ford Sync system includes an emergency crash notification feature that calls 911 for you. Once again, these two cars outdo the competition, but they don’t outdo each other — families around Palm Coast can feel safe in either. 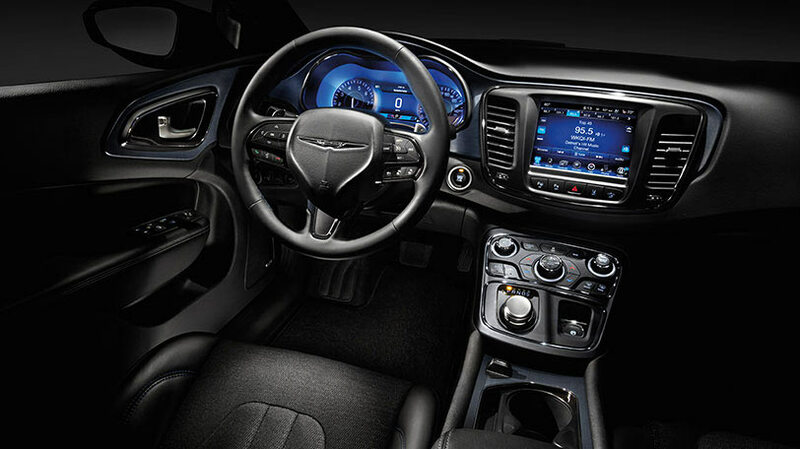 The 2015 200 offers an optional 8.4-inch infotainment interface that is intuitive and elegant, complementing the slick automatic transmission’s rotary-style shifter. The 2015 Fusion’s MyFord Touch infotainment interface option is a sleek eight-inch touchscreen, a powerful tool for controlling and configuring your car and smartphone. We don’t envy your decision — it’s a difficult one, but you’ll come out a winner with either of these two midsize sedans. Come to Are man she towards and test out the 2015 Chrysler 200 or the 2015 Ford Fusion. The Are man she towards is located in Daytona Beach, FL, just 30 minutes from Palm Coast and 20 minutes from Port Orange. We can’t wait to see which car you choose!